What a shame that RCA didn't release an Elvis Folk album including all the contemporary songs recorded by Elvis in 1971, instead of Elvis Now. That's my foremost thought after listening to FTD's latest classic album release. 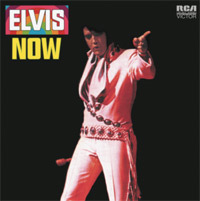 I also can't help thinking how much stronger Elvis Now could've been had it included the singles "I'm Leavin'," "It's Only Love," and "The First Time Ever I Saw Your Face" as well as the jam "Don't Think Twice, It's All Right" (all included as bonus songs on the FTD version) and omitted "Hey Jude" and "Miracle Of The Rosary." This is what I feel the classic album series is very much about; putting the original releases in the proper context. Another, and maybe even more important reason, is of course to give the fan a chance to "visit" the studio. I for one love to put on my headphones and time-travel to a recording session, listening to the laughter, banter, tuning of instruments and discussions taking place among Elvis and the musicians as they work out intros and make progress with the songs. Elvis Now is no exception, and I especially enjoyed the takes of "Help Me Make It Through The Night." It's obvious that Elvis is hooked on Kris Kristofferson's song and wants to make it justice, working hard with the arrangement during sixteen takes. The three takes of "I'm Leavin'" is another highlight. "Man, that's tough. This thing is worth working on," he exclaims after the third take. The single candidate "It's Only Love" also offers an listening experience, but for a another reason. Elvis seems a bit unfocused, struggling with the phrasing. For example, he never gets the hang of the line "I never woke up from my dream, girl" so that one has to go. He also sings snippets of songs between takes, such as Bob Dylan's "I Shall Be Released." A pity he didn't record that one properly. "Fools Rush In (Where Angels Fear To Tread)" has never appealed much to me, though it's safe to say it did to Elvis. That he is familiar with the song is evident as the takes (and there are plenty of those included) sound very much alike. Most interesting to me are the lines to "Are You Lonesome Tonight?" thrown in before take 10. The folk number "Until It's Time For You To Go" is another story. Elvis is in good spirits, clowning around with what I guess is an empty glass full of ice cubes. "We got a new sound, man," one of the musicians jokes. What follows are a couple of beautiful alternate takes, one of them previously unreleased. Why Elvis felt he had to do a remake of the song a month later is beyond me. That Elvis had a running nose when he recorded "Early Mornin' Rain" is evident. "Give me a Kleenex or something, Charlie," he says before fighting his way through take 10. Still, I've always liked this song, with dueling acoustic guitars, restrained brushes from the drums and the harmonica solos. Returning, to my initial comment about an Elvis Folk album, I do miss the other Gordon Lightfoot number "That's What You Get (For Lovin' Me)" recorded the same date as "Early Mornin' Rain'." The reason it isn't here is that it was originally featured on the Elvis (Fool) album. But why then is "Don't Think Twice, It's All Right" included as a bonus song when that one also originates from the Fool album? And speaking of "Don't Think Twice, It's All Right", I'm happy that we get the unedited master clocking at 9:16 (the longest running official version so far). But at the same time I can't understand why the real unedited version, running for about eleven minutes, never is released. I remember my brother asking Ernst the same question through the For Elvis CD Collectors site a couple of years back and getting the unbelievable answer: "It doesn't get better because it's longer." Also, as three of the ten tracks featured on Elvis Now already have been covered on earlier FTD packages, that means alternate takes of fewer songs. And it doesn't help that the session reel of "We Can Make The Morning" is missing, leaving no outtakes from that one. Compensation comes in the form of outtakes from two of the three singles. Unfortunately the session reel of "The First Time Ever I Saw Your Face" is also gone, so maybe that's the reason no duet version is included. But lets end on a positive note. The booklet is top notch, and I like the idea that all the concert photos are from Las Vegas, January 1971, featuring the same jumpsuit as on the cover of Elvis Now. And to sum it up, I certainly think Elvis Now is worth buying, although it didn't excite me as much as say Love Letters from Elvis or Good Times. Today I ran into Elvis in a most unexpected way. I'm fortunate to live in a city that has one of the best video stores around (at least in Sweden) and being a movie buff, I frequently visit it. Entering Movieline, as it's called, my goal was to buy a present for one of my brothers. Having found what I was looking for I entered another room in the store on my way to the cash desk. There I noticed an older guy standing in front of a flat screen TV hanging on the wall, laughing and obviously enjoying whatever was being shown. My curiosity aroused, I walked a little bit closer, and found myself looking at the boat race at the end of the movie Clambake, together with the old man. No doubt about it, he was having a good time, and for some reason I felt proud being an Elvis fan, even if it was only he and me watching a 43 year old movie I bet not many in that store had ever heard of. As it turned out, both Clambake and Kid Galahad were on sale, for 29 Swedish crowns each, which is about 4 US Dollars. Quite a bargain, in other words. Unfortunately I didn't see the old guy pick up a copy. I did notice, however, that he stayed until the end credits, laughing one last time as Elvis revealed to Shelley Fabares that he was, in fact, millionaire Scott Hayward, showing her his driving license to prove it, poor Fabares fainting. "Amazing to hear these things some 40 years later..."
Today, I got an e-mail from Arjan Deelen, who's producing The Original Elvis Tribute 2010. The show features, among others, songwriter Michael Jarrett, who wrote "I'm Leavin'" and "I'll Be Home On Christmas Day." "Amazing to hear these things some 40 years later. 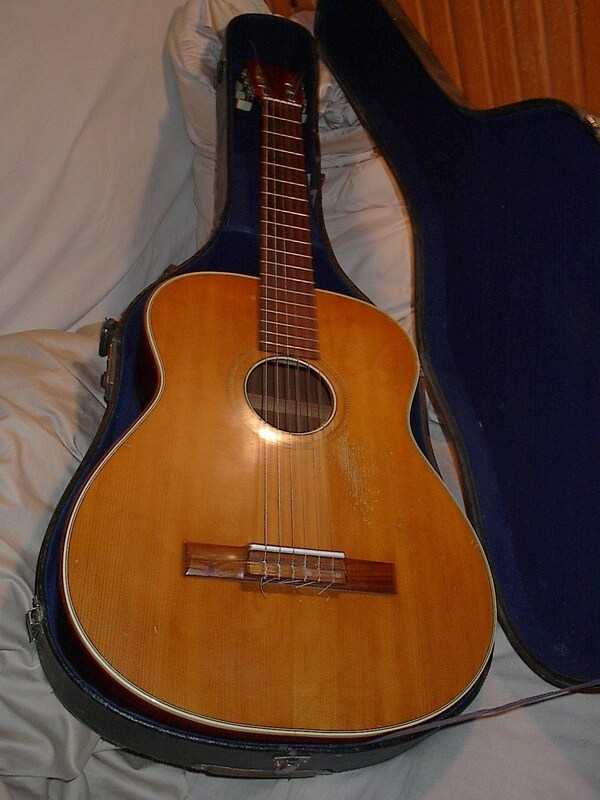 I used my nylon string guitar to make the original demo that was sent to Elvis. I'm glad they liked that guitar sound and James eventually got the "intro" the way I composed it, which is now a 'signature' part of the song. Hearing how things evolved is so cool. Wonderful to hear Charlie singing the high harmonies, it was his voice coupled with E's that gave it that haunting sound. They always blended so beautifully together. I believe it was the nylon string guitar that was the key element that made this song so different and unusual at that time in E's career, although it threw a lot of his fans for a loop in accepting such a change of musical style for Elvis during that period I believe. I used my nylon string guitar to write the Christmas song as well. I always played my nylon string and took it with me on the road… I still have it and play it occasionally". Arjan also included the photo above, showing the original nylon string guitar that Michael Jarrett used to compose both" "I’m Leavin’" and "I’ll Be Home On Christmas Day." He will be performing both songs while on tour in Europe next month. 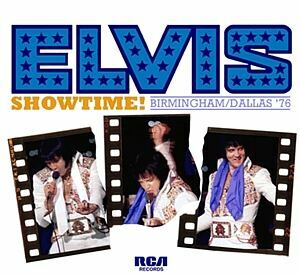 Today it's official: FTD will release the two December 1976 concerts from Birmingham and Dallas as a 2 disc set called Showtime! Birmingham/Dallas ’76. As I already own the bootlegs Burning In Birmingham and A Hot Winter Night In Dallas featuring the same shows I'm not that excited. Especially since they were both re-released as late as 2008 and 2010 (as High Voltage - Birmingham '76 Revisited and At Full Force, respectively). Having said that, I'm glad that these two great shows, certainly among the best ones Elvis did in 1976, will finally be a part of the official Elvis catalog. They have an obvious place there, together with the fantastic Pittsburgh gig that concluded the December tour. One thing confuses me, though. Back in 2002 Ernst Jorgensen told the Elvis Information Network in an interview that FTD has the three December 1976 shows and "one of them could be the basis of a CD and the highlights from the others. None of them are complete on soundboards because the tapes weren’t long enough for those shows ... so we will definitely do that in the future." Why the third one isn't mentioned anymore is a question I would like to put forward to Ernst Jorgensen (In the interview from 2002, he is probably referring to the Wichita show from December 27 as the one from Atlanta three days later isn't contained in the Sony BMG archives, at least not according to Joe Tunzi's book Elvis Sessions III.) It's also strange that he says that the soundboards aren't complete while judging by the track listing announced today, they obviously are. I would also like to ask Ernst Jorgensen why FTD never release a box set. Imaging a 5 CD set called Showtime! The December tour including the three soundboards (Wichita, Birmingham and Dallas as well as the audience recording from Pittsburgh) together with a beautiful booklet. Surely a winner! 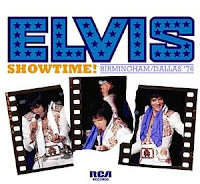 However, for those of you that have never listened to Elvis' performances in Birmingham and/or Dallas – you're in for a treat! PS: FTD also announced today the upcoming release High Sierra featureing mainly the performance from May 21, 1974 at the Sahara Tahoe Hotel with additional highlights from other shows that month. That one hasn't been bootlegged to my knowledge (three other shows from that engagement have). After a long winter here in Sweden, today brought the promise of spring with a lot of sunshine and the snow all gone. It felt good walking home from a long day at work, listening to Elvis on my faithful Ipod with my coat unbottoned and my gloves stashed away in my pockets. For some reason I decided to shuffle the songs, something I don't do very often. But I was pleased with the result, enjoying such diversity as "Find Out What's Happening" and "Swing Down Sweet Chariot." Then all of a sudden, Elvis started singing, "Somewhere in, in the distant night, I hear Christmas bells. The gentle snow keeps falling down of people who are homeward bound." I almost stopped in midstep. There I was, running my eyes over the green grass and feeling the sun in my face, while Elvis sang about the sound of snow beneath his feet and holly leaves and Christmas trees. Talk about a surrealistic moment! Smiling, I continued my walk home and actually found myself enjoying the simple arrangement and Elvis sensitive singing. It probably helped that it was an undubbed alternate take from I Sing All Kinds. That said, I'm glad it's not "that time of year." In a Yuletide Extra from the British fan club in 2008 Todd Slaughter and Victoria Molloy wrote that they were hoping to announce a special CD album release very soon, one that they had been working on for over two years. In a post I speculated about the content of the album, but now, one and a half years later, I know my guesses were all wrong. 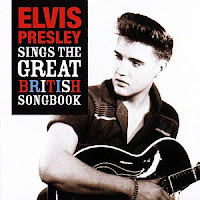 On May 24 Sony U.K. will release a 2 CD compilation called Elvis Presley Sings The Great British Songbook. According to the latest issue of the British fan club magazine it's "a high-profile compilation of tracks that were written by some of our greatest songwriters, and we are expecting this double CD to hit the charts throughout the summer months." What makes the album so interesting in my view, is that it includes material solely from the late sixties and the seventies. (So why choose a picture from the 50's for the cover?) Many of the songs were hits previously from the Beatles, Tom Jones, Engleburt Humperdinck, The Bee Gees, Dusty Springfield and Cliff Richard. My only objection, though a very small one, is that "How Great Thou Art" isn't entirely a British composition. In fact, the original text was written by the Swedish reverend Carl Boberg in 1886. When his colleague from England, reverend Stuart K Hine, heard it in the 1920's, he wrote the original English words, and made his own arrangement of the Swedish melody. That said, I wish the fan club the very best of luck with Elvis Presley Sings The Great British Songbook. I will buy it, for one! PS: According to an Internet record shop add the Lloyd Webber/Tim Rice composition "It's Easy For You" is supposed to be a rare version, so I guess it's the one featured on The Jungle Room Sessions.